1. Green Bay Packers, 5-0. The Green Bay Packers are the defending Super Bowl Champions, and with the addition of players who were injured last year, like tight end Jermichael Finley, and the continued improvement of quarterback Aaron Rodgers, they appear to be better than last season. This is bad news for the rest of the league, as they are headed toward a monster regular season. A home match up against the St. Louis Rams should keep their perfect record intact. 2. Detroit Lions, 5-0. The Detroit Lions are the biggest surprise in the National Football League thus far, at 5-0. It’s not just the record, it is how they got there. They overcame a 20-0 deficit to the Minnesota Vikings in week three, followed by a 27-3, third quarter deficit in Arlington to the Dallas Cowboys. With quarterback Matthew Stafford and wide receiver Calvin Johnson leading the offense, and defensive linemen Ndamukong Suh and Nick Fairley leading the defense, this young team will be making noise for the foreseeable future. A home match up with the 4-1 San Francisco 49ers is one of the key match ups this weekend. 3. New Orleans Saints, 4-1. Led by quarterback Drew Brees, the New Orleans Saints have one of the most explosive offenses in football. Only an opening week loss to the Green Bay Packers taints their record. The Saints do leave a lot to be desired defensively, as only seven NFL teams have allowed more points. Still, their offense will keep them in any game against any opponent, making them a legitimate Super Bowl contender. The Saints head to Tampa Bay to play the Buccaneers in what should be a game they will win. 4. New England Patriots, 4-1. 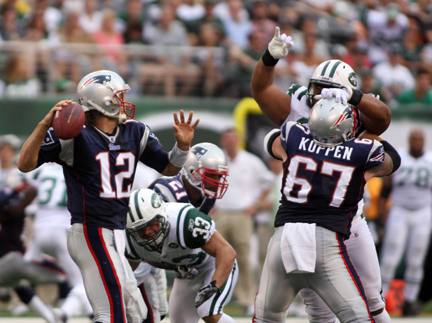 Quarterback Tom Brady has the New England Patriots again contending for a Super Bowl. With 165 points in five games, only the Green Bay Packers have scored more. As has been the case the past couple of seasons, the Patriots are not the defensive team they once were, which limits the amount of mistakes the offense can make. Their one loss, to the Buffalo Bills, saw the Patriots make an uncharacteristic four turnovers. The Patriots host a talented Dallas Cowboys team desperate for a win. 5. Buffalo Bills, 4-1. The Buffalo Bills may be the biggest surprise in the American Football Conference thus far this season. Their 138.2 rushing yards per game is fourth in the NFL and a major factor in their 4-1 start. A tough schedule will determine if the Bills are a legitimate playoff team. The Bills invade Met Life Stadium to face a New York Giants team that was embarrassed last weekend. 6. San Diego Chargers, 4-1. The San Diego Chargers haven’t had the most impressive victories, but they have won every game except for a loss to the New England Patriots. A well-balanced offense, lead by quarterback Philip Rivers and running back Ryan Mathews gives opposing defenses fits. San Diego has a bye this week after a 29-24 win over the Denver Broncos. 7. San Francisco 49ers, 4-1. The San Francisco 49ers are another league surprise, led by first-year head coach Jim Harbaugh. Their 48-3 thrashing of the Tampa Bay Buccaneers caused many teams to notice, and, playing in perhaps the weakest division in the league, the 49ers look poised to be a legitimate player in the NFC playoffs. The 49ers will face the undefeated Detroit Lions in a match up few thought would have this much importance at the beginning of the season. 8. Baltimore Ravens, 3-1. The Baltimore Ravens continue to be one of the more dominant teams in the league on defense, led by the ageless wonder linebacker Ray Lewis. The Ravens are the stingiest defense in the league, allowing only 57 points in four games, and should be near the top the entire season. Their offense, led by quarterback Joe Flacco and running back Ray Rice, will ultimately decide if they can make a Super Bowl run. The Ravens host the Houston Texans Sunday. 9. Washington Redskins, 3-1. The Washington Redskins were not expected to be in first place over the Dallas Cowboys, New York Giants, and Philadelphia Eagles, but here they sit atop the National Football Conference Eastern Division. A balanced running attack and a solid defense, combined with veteran coaching from Mike Shanahan, may cause problems for NFC East foes all season long. The Redskins host a Philadelphia Eagles team desperate for their second win of the season. 10. New York Giants, 3-2. The New York Giants are one of the more confusing teams to figure out in the NFL. When they are playing their best, they are capable of defeating any team in the league. Unfortunately for the Giants, when they are unfocused, they have the ability to drop a home game to a 1-3 team, as they did this past weekend to the Seattle Seahawks. Championship pedigree is what keeps the Giants in the Super Bowl hunt, and they will have the ability to make a Super Bowl run if they get into the playoffs. The Giants host the 4-1 Buffalo Bills Sunday. Next Story → Daily Debate: Will the Giants Rebound and Defeat the Bills? I think you’re dead-on with the Giants ranking; seeing that I’m a Giants fan, I’m glad you ranked them as 10th in the league, and I also think that when they’re hot, they’re hot. Perhaps the weirdest team to predict. They can be a different team in any game, even any quarter of any game. Thanks Ken. Who would have thought that, on paper, 49ers/Lions would be the game of the weekend and not Cowboys/Patriots? This is a great football week. I may find myself at a bar Sunday afternoon. Can’t wait until the Packers play the Lions and we see who’s the better team! Although I think the Packers are a little bit better. I agree, I think the Packers are beter, but we shall see. Meanwhile, the Cowboys and Dolphins play also on Thanksgiving. I agree with these rankings. Thank you for putting the undefeated teams at #1 AND #2. I think ESPN has the Lions fourth. If we are basing the rankings primarily on this season, what beats undefeated? I can’t argue with your rankings. This is a weird year and i don’t think we will truly know what teanms are made of for another few weeks. Teams will start to show their true colors by week 9 i believe. I think we will see some 3-4 game losing streaks by many teams the second half of the year. I agree that you can’t make too many determinations yet, but the Packers and Pats will definitely be near the top all season. I like your rankings. I think this week will tell us a lot about the Lions because they really haven’t faced a strong running team until this weekend. The Lions will dip down and the 49ers will move up, but both look for real.